Around 400 hundred worshippers mark Palm Sunday amid cyclone ruins. 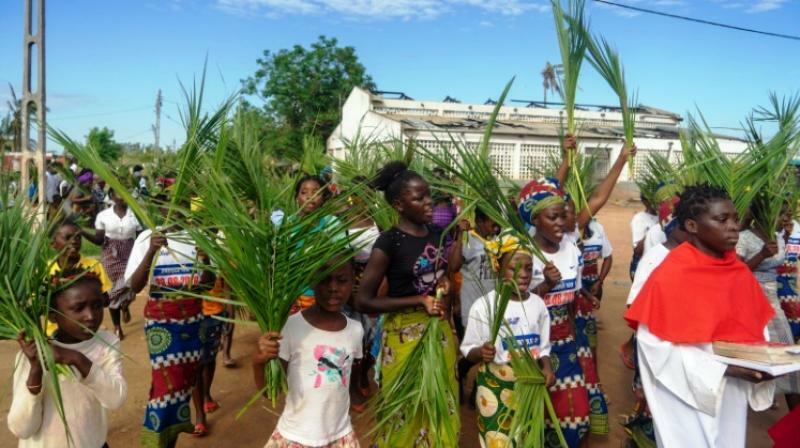 Maputo: Christians in the cyclone-devastated Mozambican town of Buzi on Sunday celebrated Palm Sunday among ruins; month after Cyclone Idai tore through the country leaving a trail of destruction. Christians in the cyclone-devastated Mozambican town of Buzi on Sunday celebrated Palm Sunday among ruins; month after Cyclone Idai tore through the country leaving a trail of destruction. Around 400 worshippers made their way through the streets for the Palm Sunday procession with fallen trees and buildings with no roofs, windows or doors still visible. One man held a wooden cross, leading the hundreds of other believers as residents watched from the terraces of buildings that survived the cyclone. The procession ended with a mass at Lady of Grace Parish Catholic Church, in the township of Barrio Manasse, whose zinc roof sheets were blown off by the cyclone. Palm Sunday marks the beginning of Catholic holy week, which culminates in Easter Sunday. "Most of our congregants are still trying to rebuild their houses that were destroyed by the cyclone," the priest, father Celso Taibo told AFP. "But we still have a high number of congregants in attendance because they still believe in God despite what happened and they believe it's no reason to stop believing in God," he said. Buzi was one of the areas hardest hit by southern Africa's deadly cyclone. Cyclone Idai cut a path of destruction through Malawi, Mozambique and Zimbabwe on the night of March 14-15, causing damage worth $2-billion, according to the World Bank. In Mozambique alone, more than 600 people died among the 1.85 million affected while over 340 died in Zimbabwe.